Service Hours: 7 AM-8:30 PM, Mon-Fri. Contact: Patrick DeMary, Owner & Shop Manager. Truck service till 8:30 PM, Monday–Friday, for all your truck repair needs. We have the latest high-tech diagnostic equipment, VIS-Check, offering “real time” analysis. We offer tailored programs and we will work with your Fleet Maintenance Company. Proper wheel alignment increases your miles per gallon and extends the life of your tires. Personal Relationship – Due to our small size and friendly staff, we are able to meet your needs on an individual basis. We have found that this is a key ingredient in understanding exactly what each company’s individual priorities are for their trucks. Taylored Fleet Maintenance – We offer tailored programs and we will work with your Fleet Maintenance Company. 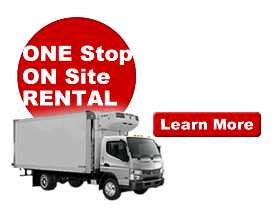 We work with, and accept direct billing from: GE Capital, ARI, PHH – Arval, Donlen, Lease Plan USA, Enterprise Fleet Services, MAP (Wheels), and Lance Fleet Services. In shop Tire Service from 7 AM to 8:30 PM, past midnight, Monday – Friday. Pick-up trucks to road tractors, alignments and wheel balancing. All Wheel Laser Alignment – Proper wheel alignment increases your miles per gallon and extends the life of your tires. Learn More. Parts Department – We also use the same high quality parts that were in your truck when you bought it or if you prefer, we have a large inventory of used parts as well as common after-market diesel parts. 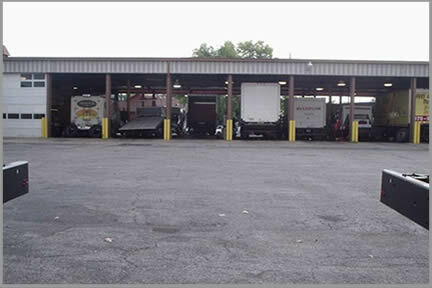 Our service facility has 22 drive-in bays and a knowledgeable staff of factory trained diesel mechanics. Our shop is geared for the fastest possible turnaround time on preventive services and repairs for all makes and models of commercial trucks. We’ll get you and your truck back on the road as soon as possible. When it comes to service & quality no one comes close to our factory trained technicians. Their excellent training and hands-on experience ensures that we’ll get the job done right the first time. We follow factory recommendations and procedures so that the job gets done the way it was intended. Time to start thinking about warmer weather! BE PREPARED. 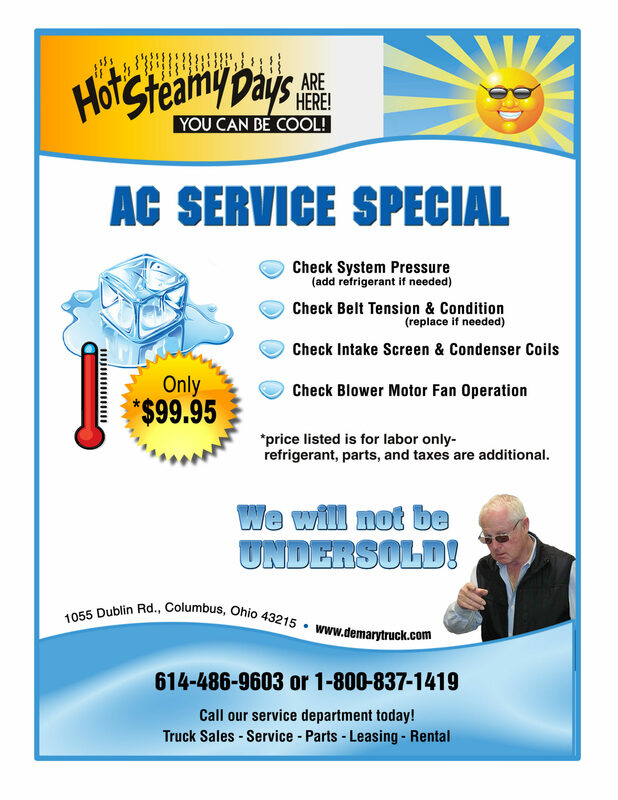 Schedule your AC SERVICE now! At DeMary Truck we can get your trucks ready for another Hot Ohio Summer! Schedule your AC SERVICE today! Click the image for more details. Inspection Systems Check. Click here to learn more or click the image to the left to watch a short video about the benefits of an Inspections-Check.